After the box office disappointment and mixed critical notices of Mars Attacks! 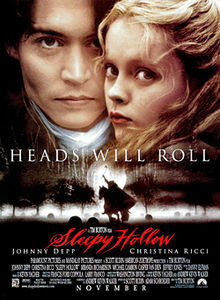 (1996), director Tim Burton returned to theaters in 1999 with the triumphant Sleepy Hollow, a dark fairy tale powered by the pervasive millennial angst of the era. Although the picture is set in the year 1799 rather than two centuries later, Sleepy Hollow nonetheless obsesses on roiling concerns regarding the future. Would it belong to science or to superstition, knowledge or mysticism? Would the future bring only a new dark age (Y2K) or the beginnings of paradise on Earth? Widely recognized as an example of "gorgeous filmmaking," (Rolling Stone), Sleepy Hollow was lauded upon release for its lush production values and colorful, autumnal imagery. Stephanie Zacharek at Salon, for instance, aptly termed the film a "visual seduction." As I wrote in Horror Films of the 1990s, Tim Burton’s Sleepy Hollow opens with a droll visual joke that, in some fashion, very ably exemplifies the film's nature. Perhaps this joke is one that only the longtime horror movie enthusiast will fully understand. As the film commences, what appears to be very fake-looking red blood drips down upon a parchment. This fluid is soon revealed instead to be hot wax, used merely to seal an important letter. Yet for a fleeting -- and wonderful -- moment, the horror audience may believe it has actually returned to the wonderful and bygone world of Hammer Studios since the hot wax resembles that trademark Hammer-styled “fake” blood. Or, as Wesley Morris wrote in The San Francisco Examiner: "what Burton does perhaps better than even Steven Spielberg: transport you to a nook in your childhood, be it around a summer campfire or smack in front of a TV set on a Saturday afternoon." In the visual language of a Hammer Studios film then, the impressive Sleepy Hollow asks its audience to contemplate the nature of life on Heaven and Earth. Is science the key to understanding it? Or is there room, yet, for magic in this world? In scenes both lyrical and poetic (particularly those involving Lisa Marie as Ichabod's mother), Burton's Sleepy Hollow seeks the answer. Less deliberately oddball than some of Burton's earlier works but nonetheless highly-stylized from a visual standpoint, Sleepy Hollow thus emerges as one of the top "tier" films in the director's canon; a bedtime story that maintains, even today, the kind of timeless, classic qualities of the best ghost stories. "It is truth, but truth is not always appearance." 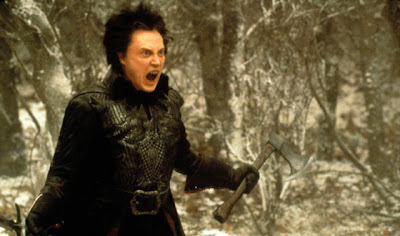 The rational, scientific constable Ichabod Crane (Johnny Depp) is sent by his superior (Christopher Lee) to the Dutch farming community of Sleepy Hollow to investigate a series of grisly murders allegedly caused by a spectral avenger called the Headless Horseman (Christopher Walken). When he arrives, Crane begins to uncover evidence of witchcraft in the Van Tassel family, even as he grows close to Baltus Van Tassel’s (Michael Gambon) daughter, Katrina (Christina Ricci). The specter of witchcraft strikes a chord with the cowardly Ichabod, however, as Crane's mother (Marie) was also witch. As the mystery of Sleepy Hollow deepens, Crane wonders if someone is summoning a dark, malevolent spirit for monetary gain, and if so, who it could be. He realizes that to learn that answer, Crane must not depend on science alone, but open himself to the possibilities suggested by his mother; the possibilities of magic. "The millennium is almost upon us..."
Although based very loosely on the 1820 short story The Legend of Sleepy Hollow by Washington Irving (1783-1859), Tim Burton’s Sleepy Hollow serves instead as a dedicated tribute to the output of Hammer Studios, England’s pre-eminent exporter of horror during the late 1950s and 1960s. Not only does this film feature familiar horror actors from the Hammer stable, including Christopher Lee and Michael Gough, it is also, like the works of that studio, largely set-bound, and it embodies a similar, heavy sense of Gothic romanticism. Crane has put his faith in technology and reason, and believes that “to detect the guilty” science is the best tool. He disdains the fact that he seems to be the only one "who can see that to solve crimes, we must use our brains, assisted by reason, using up-to-date scientific techniques." That battle between the two ways (rational science and irrational mysicism) is the real thematic terrain of the film. Almost immediately, Crane’s strategy is tested, and he encounters a world of very real superstition and witchcraft. Crane rejects these principles at first, in part because his Mother was a witch (a good witch…) and he lost her in a painful, violent manner to a society which condemns such practitioners. Looking at Crane’s dream sequences involving his mother, they pointedly contrast with the soot-and-industrial look of New York featured in the beginning of the film. The “cherry-blossom-filled reveries” (Interiors: "Here's Your Head, What's Your Hurry?" December 1999, page 62) suggest a world beyond reason and natural sciences; one more fully alive than what is depicted in the bleeding forest around the town. The forest there appears so autumnal and brown, I would submit, because magic and witchraft are disappearing from the world: it is their final autumn before Ichabod's way will dominate the human race. Even the (ostensibly happy) end of the film reinforces this idea, with the arrival of Katrina and Ichabod in "modern" New York...a realm of science. Interestingly, Sleepy Hollow does-- at least partially -- seem to view the loss of magic and the victory of science as a loss for mankind. Though whip smart, knowledgeable and clever, Ichabod suppresses his own “natural gift,” the one handed down to him by his mother: his capacity for belief in something greater than the resources and wonders of man’s mind. In this sense, one might gaze at Sleepy Hollow as a tale of one man’s spiritual, even religious, awakening. Crane comes to see that he can't depend on science alone, but also must understand the rules of magic; on his instinctive sense of wonder. And like many a Tim Burton hero, The Headless Horseman in Sleepy Hollow is another outcast, but in this case, one who fits explicitly into the movie's dialogue about nature vs. supernature. The Hessian is doomed to walk the Earth at the behest of an evil mistress, and Sleepy Hollow involves the freeing of this spirit and outcast. Thus the Hessian serves as almost a mirror for Crane. The Headless Horseman is a man who exists in a purely supernatural (rather than scientific) state and must be put to rest; to the clinical, empirical state of death, upon which his release hinges. His release rests in science, or release from the supernatural, in other words Together, Crane and the Hessian make an interesting duo. Two sides of the same coin, perhaps. 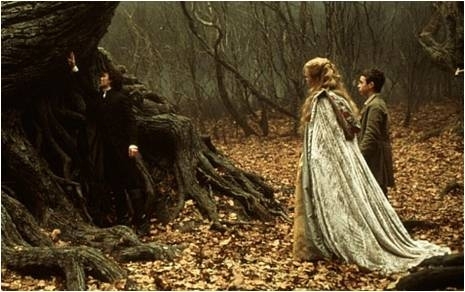 Uniquely, Ichabod's journey may also be a reflection of how cinema (particular the horror cinema) had grown cold and clinical in the 1990s. This was the era of 1,001 police procedural horrors, roughly (The Silence of the Lambs, Jennifer 8, Se7en, Kiss the Girls, Resurrection, Copycat, The Bone Collector, etc.) and such films reduced the great act of "monster"-hunting to a science, a forensic science. Ichabod is clearly in the mold of such CSI-styled investigators (nay a progenitor of their mold...) and yet in the end it is not forensics that saves the day in Sleepy Hollow...it is the investigator's natural gift, his ability to countenance magic. One might easily see this conceit as Burton's embedded critique of the increasingly stale take on horror at the turn of the millennium. With its beautiful fairy tale forests and deliberate Hammer Studio artifice, Sleepy Hollow seems a deliberate and almost elegeic throwback to an era of imagination and theatricality instead of gritty psychological realism. At one point in the film, it is noted that Crane is actually "bewitched by reason," and that comment perfectly captures the film's questioning spirit, the idea that science and belief must walk hand-in-hand in the human equation. And so even though Katrina fears that Crane possesses no heart (only a mind), the same cannot be said for this lush, gorgeous, Tim Burton film...undeniably one of his finest. When I saw this in the theater I was so delighted by the opening sequence. As I had spent many Saturday afternoons watching much of the Hammer Studios output on "Creature Feature". Oddly enough I've never made the connection that you are so right about concerning this film. Excellent review, my copy is in PGH, and I'm FL, or I'd pop it in the player right now. As I'd expect, you've given this outstanding film its due, John. As you may recall, this one is an annual screening for me come Halloween time (and this year, I introduced it to my son, who was equally entranced by it). This is another production of Burton's that really makes excellent use of art direction. In fact, it's this film that I point out to all who'd listen that the town of Sleepy Hollow (in all of its sets) is the other lead character in the piece. It has affect on all of those who inhabit her (I opine it is a female persona) and they on her. Note her change of hue from beginning to end as the evil spell of Lady Van Tassel is broken. This film remains remarkable for that atmosphere you've noted and the sets that really drive its mood. Excellent detail about the Hammer film acknowledgment and influence in 'Sleepy Hollow', one that it so happily bares to its audience I might add. Still, I would point out the small and wonderful homage the film contains toward the 1961 Roger Corman classic, 'The Pit and the Pendulum'. [spoiler] The flashback to when Lord Crane drags Ichabod's doomed mother to his 'chamber' is another take on Vincent Price's character with his wife scene from the earlier adaptation of the Edgar Allen Poe story -- especially the keen the use of The Iron Maiden (who can forget the film's last shot of Barbara Steele!). That's also an appropriate device in this as it actually was invented in the 19th century (not in the Middle Ages), a period and climax that is a theme in this story. Lastly, I would offer another thread running in this, one of my all-time favorite Tim Burton, film. I very much agree with the "rational science and irrational mysticism" battling it out here, as you deftly layout, my friend. But there is a male/female vibe here as well, each holding on to their views of the world back then (which in turn hold them back). You'll note Baltus Van Tassel is traditionally dismissive of the women in the film, especially when it came time for the men to talk with Ichabod about the goings on (and it's Lady Van Tassel behind it all as she controls the horseman!)[\spoiler]. Plus, the mystery only gets solved, and the hex broked, when Ichabod and Katrina pool each of their disparate outlooks together. In other words, when the woman begins to be treated as an equal -- a movement hinted to come in the next century. Finally, the female persona of the town I mentioned earlier is contrasted with the town leaders (all male) wishing to lay claim to her resources (and the women of the town) as only merchants (and men) feel is their right. Something to think about, perhaps. I've never tired of this movie, and I still remember my experience with it on first release to theaters. Thanks for giving it a thorough look, my friend. Fantastic flick for all the reasons your lovely review stated. I couldn't help but think of one of the devils in Millennium's Somehow Satan Got Behind Me: "Mankind has progressed to a point in its dim-witted history where life has been drained of all of its enchantment." With movies like this, almost, but not quite. Great commentary here on this Burton film from 1999. Jane: I'm so glad you are also a fan of this movie. It really does capture the Hammer Studios vibe beautifully, and is always worth a re-watch! Le0pard13: Fantastic excavation of this film, sir! I had not considered the film's homage to The Pit and the Pendulum (1961), but my gosh, you are so right on that front. I never even saw that until you brought it up. Hi Randal. I love the quote you brought up from Millennium: "Mankind has progressed to a point in its dim-witted history where life has been drained of all of its enchantment." That really does capture the essence of Sleepy Hollow, I think. Perfect! 11/11/11 - Nigel Tufnel Day! Not Bad for a Human Contest!